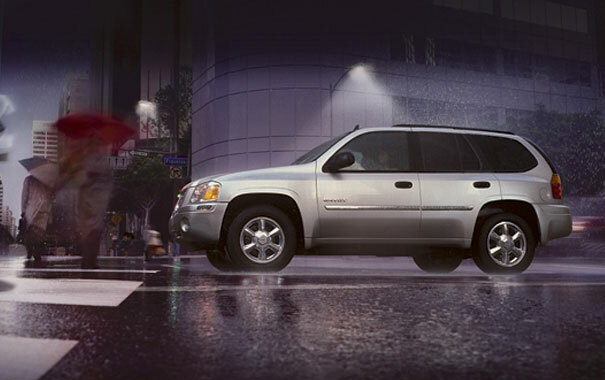 San Francisco: The GMC Envoy Denali is the latest addition to the wide-ranging Envoy lineup. It offers more luxurious features and a quieter cabin to give it the Cadillac treatment with a GMC badge. Good interior materials and construction make the Envoy feel upscale, especially in the Denali models. With so many variations of the Envoy available, it seems GMC is trying to make an SUV for everybody. After starting with the basic Envoy in 2002 - a solid, mid-size SUV with a nice ride and quiet cabin - the honchos at General Motors decided it wasn't big enough. So in 2003 a longer version was created and dubbed the Envoy XL. Then for 2004 the honchos decided the Envoy XL would be better with a pickup truck bed, and they built the Envoy XUV. It comes with a big, retractable roof for hauling trees and other bulky cargo in the convertible bed. Finally for 2005 the honchos decided none of the Envoys were quite fancy enough. Thus they created the Envoy Denali and Envoy XL Denali, which are more like Cadillac’s and less like workaday SUVs. The result is a family of very different SUVs that all share one name. There are lots of differences between the various models, but the biggest is between the standard-length Envoy and the extra-long versions. While the normal Envoys are a breeze to maneuver in parking lots and have a silky highway ride, the stretched versions seem like totally different vehicles. They have a bouncier, more truck-like ride and feel like your steering an aircraft carrier in the parking lot. On the upside, the longer Envoys offer a third row of seating and more cargo space, something people with families should appreciate. Two engines are available: a 4.2-liter I-6 and a 5.3-liter V8. The 275-horsepower, six-cylinder engine is a better choice unless you need serious towing capability, as it feels smoother and more refined, has better gas mileage, and accelerates nearly as well as the V8. If you do need the V-8, rest assured it's a good one. It makes 300 horsepower, 330 foot-pounds of torque and has GM's Displacement on Demand technology that essentially turns off up to four of the eight cylinders when they're not needed. That's important in a period of high gas prices. Fuel consumption ranges from 16 / 21 city/highway miles per gallon in the Envoy with a six-cylinder engine to 15 / 18 in the Envoy XL with a V-8. It's no gas sipper, but it's not awful considering the size, weight and capability the Envoy offers. While pain at the pump is the Envoy's major weakness, its interior has to be its best feature. Materials used in the cabin are outstanding, especially compared to GM's SUVs a few years ago. Everything fits well, most materials are soft to the touch, and its color scheme gives it a slightly upscale feel. It's also a surprisingly quiet SUV, as little wind and road noise filters into the cabin. Denali models feature even more acoustic materials to make them quieter than the standard Envoys, including laminated glass, a sound absorber in the dash, a quieter exhaust resonator, and sound-absorbing insulation. All in all the Envoy family has enough variants to satisfy most needs and wants. Whether you need basic family transportation or a luxury yacht for the highway, it's all available behind the Envoy badge. What was tested? 2005 GMC Envoy XUV ($33,795). Options: Entertainment package ($1,370), luxury package ($790), V-8 Power Play Package ($1,770), navigation radio system ($1,600), Onstar Plus package ($970), curtain air bags ($495), polished aluminum wheels ($495), running boards ($375), special paint ($165), adjustable pedals ($150). Total (including $3,150 option package discount and $685 destination charge): total MSRP came to $39,560.